As with previous years the action kicks off from 2pm in Pencaitland’s Trevelyan Hall. Groups or families turning up will be given litter pickers and bags before heading off to various parts of, not only Pencaitland, but hopefully some of the other areas covered by the Community Council. We’re particularly keen to have groups or families who want to cover Glenkinchie or New Winton this year. 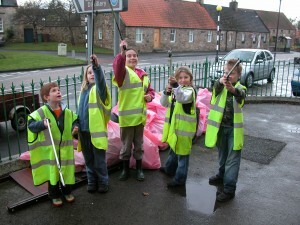 Pencaitland’s regular community Litter Pick is set to take place on Sunday the 11th May from 2pm. This year’s free prize draw, open to all under-16s taking part in the Litter Pick, is a Samsung ST72 16MP camera with 8GB card included. Then, once your area has been covered, pop on back to Trevelyan Hall with your haul of flotsam and jetsam where there will be refreshments and the opportunity for anyone under 16 to participate in our free Prize Draw for a fabulous compact Digital Camera. This year it’s a Samsung ST72 digital camera and it comes with an 8GB memory card so you’re ready to go. 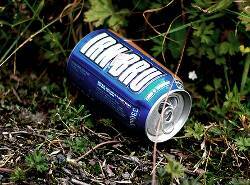 For 2014’s Litter Pick we are working with Clean Up Scotland, part of the charity Keep Scotland Beautiful. We’ll also be handing out tabards to make everyone stand out as they seek out the oddest item of rubbish. Last year we had a great selection of litter oddities including a truck mud guard, four car hubs, signs, clothes, shoes and many many cans, bottles and crisp packets. Let’s see if we can find even more unusual stuff this time round. If you have a camera please grab some photos during your Litter Pick and email them to us at website@pencaitland.org where we will then feature them on the website. Thanks to everyone who made their way to Trevelyan Hall to help out with this year’s Pencaitland Annual Clean-up. People began arriving from 9.30am and throughout the morning to help out. A number of people commented that the village already looks pretty clean, but look again and all sorts of discarded detritus begins to surface. One family managed to fill a Council refuse sack after just covering Beech Terrace, Dovecot Park and the Mercat Cross. Groups covered a wide range of areas across the village, discovering all sorts of stuff – car parts and a number plate included. Special thanks to Mary McCall, Head Teacher of Pencaitland Primary, who made her way to Trevelyan Hall to help out with the clear up and who kindly ensured that local parents and pupils were made aware of the event in advance. Just a quick reminder to residents in and around Pencaitland that we’d really welcome anyone who can spare a little time to pop down to Trevelyan Hall on Saturday the 7th at 9.30am and join us as we drive to clear up that litter that never made it into the local bins. If you care about the quality of our local environment then please pop along and spare an hour towards keeping Pencaitland the pleasant and attractive village it is today. There will be refreshments on the day too. Just a quick note to let everyone know that the Community Council is running the annual litter collection on the 7th of May this year. If you would like to take part please email Frank Stacey from the community council for details, or you’re very welcome to simply turn up on the day at 9.30am, Saturday the 7th of May outside the Trevelyan Hall.